Space debris in low Earth orbit (LEO) could be reaching a tipping point according to a UN report (Credits: Roger Harris/Science Photo Library). A report from the Inter-Agency Space Debris Coordination Committee (IADC), which is meeting during the 50th Session of the Scientific and Technical Sub-Committee to the Committee on the Peaceful Uses of Outer Space (COPUOS), states that the debris situation in low Earth orbit (LEO) may be reaching a catastrophic tipping point. This tipping point, known as the Kessler Effect, was first predicted by Donald Kessler from NASA in 1978. The Kessler Effect envisions a scenario where the density of objects in LEO is high enough that collisions between objects will cause a cascade of collisions with each collision generating space debris thereby increasing the likelihood of further collisions. One inference of this cascade event is that the distribution of debris in orbit could render space activities in LEO, including the use of satellites such as the recently launched Landsat 8, impossible for several generations. The study presented by the IADC used six space debris models from six IADC members: ASI, ESA, ISRO, JAXA, NASA, and UKSA. Each of the models used a 2009 baseline environment for space debris larger than 10 centimeters, which was provided by ESA’s MASTER model. From this baseline, all six models used a future space traffic assumption based on space traffic from 2001 to 2009. From this point, each model used its own solar flux projection standard with a future post-mission disposal (PMD) compliance level assumption of 90% for both spacecraft and launch vehicle stages. All the models defined a “catastrophic collision” as one with an impact kinetic energy to target mass ratio of 40 joules per gram or greater. The results of all six models programmed with these assumptions showed similar qualitative results in the increase in the amount of space debris larger than 10 centimeter in LEO over the next 200 years. The models varied in the number of catastrophic collisions from one every five years to one every nine years, but they did agree that the majority of catastrophic collisions will occur in LEO altitudes above 800 kilometers with the majority of debris accumulating between 800 kilometers and 1000 kilometers over the next 100 years due to the proliferation of space objects at those altitudes. Space debris below 800 kilometers is less likely to accumulate because of atmospheric drag, which was recently evidenced with the reentry of the Earth resource satellite Cosmos 1484 after nearly thirty years in orbit. The study concludes that there is a growing instability in the current LEO environment, and that compliance with the current international space debris mitigation guidelines will be insufficient to restrict the population of LEO with space debris in the future and recommends aggressive measures to remove larger non-functioning spacecraft and launch stages in a cost-effective manner. However, aggressive space debris removal is easier said than done. Substantial legal and policy questions surrounding space debris remediation exist that need to be addressed. For example, there has yet to be a legally acceptable definition of what constitutes space debris and issues of liability for space debris remediation activities. 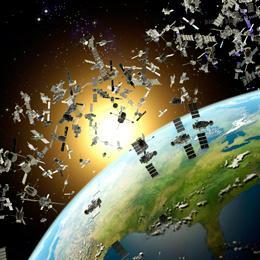 There are also substantial political questions regarding the potential use of space debris removal methodologies as space weapons as well as the issue of who will pay for the enormous cost to perform space debris remediation activities. While these issues remain, and safe, cost-effective methods of remediation are developed, the implementation of effective space debris remediation activities is unlikely to begin in earnest. In the meantime, the space debris environment in LEO will continue to grow, while the window of opportunity to address these issues and begin remediation activities in earnest before the problem spirals out of control is rapidly shrinking. Forget the Mars Rover… NASA needs to get on with the building of the SPACE ROOMBA! the land sat 8 is higher than low earth orbit along with most satellites. At 705 km, Landsat is still considered to be well within low Earth orbit. With the notable exception of GPS and similar constellations, most satellites inhabit either low Earth orbit or geosynchronous orbit.